Relax. George told me I only had 10 minutes. He was very direct about it. It wasn't even funny. Now, I first met my friend, my dear friend, George Bush, in 1962 when my father, Milward Simpson, was a member of the United States Senate, just elected, and I came back to Washington with dad to settle on his new office being vacated by one Senator Prescott Bush, George's father. Well then, we met again when my parents left Washington and sold their home to a brand spanking new congressman from Texas named George Herbert Walker Bush. So George and Barbara, mom and pop did that sale on a handshake. Sound familiar? Then I came to the Senate in 1978 and soon after that Ronald Reagan cornered me and asked me to support him for president. I said I would — not knowing that my friend George would enter the fray. Hearing that, I called and I said, "George, I want to tell you I'd love to help but I already committed to Ronald Reagan." George's response, "Well Al, I'm sorry about that. I probably should've let you know sooner." And actually, a guy doesn't get very many calls my friend who says they can't support him. Sound familiar? Of course it does because in George Bush's theme of life during all the highs and lows, there was a simple credo: What would we do without family and friends? And when he became vice president, our friendship, our enjoyable friendship was refreshed and the four of us had many, many pleasant times together. And my life in Washington was rather tumultuous. I went from the A social list to the Z. And never came back to the A. In one dark period I was feeling awful low and all my wounds were self-inflicted, all of them. And George called me early one morning, always early in the morning, country music playing in the background and he said, "Ah, I see that media is shooting you pretty full of holes." Actually, he said it a bit more pungently than that. And he said, "Why don't we go up to Camp David? You and Ann come over and we'll have a weekend together. At that time, his popularity rating was 93 percent. Mine was .93 percent. And so off we went. The media of course all gathered as we headed to Marine One and George said, "Now wave to your pals over there in the media, Al." And they didn't wave back. "There were staff members, Al, who told me not to do this, but Al, this is about friendship and loyalty." Sound familiar? Well we had an awful lot of fun too. Always a delight to be in the president's box at the Kennedy Center, off to play at the National Theater or the Warner with the Bush's. And outside of the president's box that one evening, there was a massive 6-foot vase with an extraordinary glaze. I hope you know the difference between a vase and a vase. $35. Now George walked up to it and he said, "Al, wait, I think that's Etruscan. I noticed that," he said, "This blue grayish glaze from that period, a clay that could only be found during that era." And I said, "No, no George, the patina there gives me the perception it was possibly older, perhaps of Greek origin with that particular horrible paste before firing." Of course people gathered around mumbling about these expert observers and Barbara and Ann finally came by and said, "Get out of here." "Both of you get back in that box." Well we did. Well it was impressive for a while and then of course one night the four of us went to see a Michael Crawford singing the songs of Andrew Lloyd Webber. All four of us were singing as we went back to the White House. "Don't cry for me Argentina." And tidbits from Phantom of the Opera and other magic of Webber. And a few days later he's getting hammered by the press for some extraordinarily petty bit of trivia and suddenly he sings out, "Don't cry for me Argentina." The press then wrote that he was finally losing his marbles. Now, these honored guests right here before us who have held this noble post no well of the slings and arrows of outrageous fortune. He was a class act. From birth to death he housed the strong sinews in mind and body gained from that extraordinary mother. We compared our mothers as velvet hammers, of course, and most certainly awesome fathers. The history books will and are treating him most fairly. While uncovering some other powerful traits, his great competitiveness, his raw courage and his self-discipline, recall the Andrews era based conclave where congressional participants drafted a remarkable bill that dealt with two-year budgeting, entitlement reform, comprehensive and catastrophic healthcare, Social Security solvency, and much more. But required a critical ingredient called revenue. Translated into the word taxes. Translated into the words, read my lips. And the group went to George and said, "Look, we can get this package done, but we must have some revenue." And he said, I'll never forget, he said, "What I've said on that subject sure puts a hell of a lot of heat on me." And then they all said yes, but we can get it done and it will be bipartisan. And George said, "Okay, go for it but it will be a real punch in the gut." 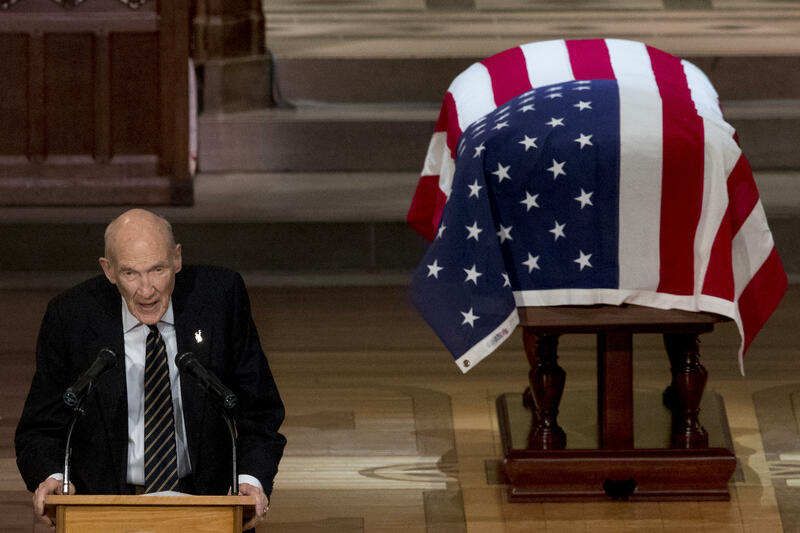 Bob Dole then a loyal warrior for George, took it back to the Senate and we won a very strong bipartisan vote. And went over to the House where his own party turned on him, surely one of the main factors ensuring his return to private life. But he often said, "When the really tough choices come, it's the country not me. It's not about Democrats or Republicans, it's for our country that I fought for." And he was a man of such grace, humility, those who travel the high road of humility in Washington DC are not bothered by heavy traffic, and he had a very serious flaw known by all close to him. He loved a good joke. The richer the better, and he threw his head back and give that great laugh, but he never ever could remember a punch line. And I mean never. So the punch line for George Herbert Walker Bush is this. You would have wanted him on your side. He never lost his sense of humor. Humor is the universal solvent against the abrasive elements of life. That's what humor is. He never hated anyone. He knew what his mother and my mother always knew. Hatred corrodes the container it's carried on. The most decent and honorable person I ever met was my friend George Bush, one of nature's noble men. His epitaph perhaps just a single letter, the L for loyalty. It coursed through his blood, loyalty to his country, loyalty to his family, loyalty to his friends, loyalty to the institutions of government and always, always, always a friend to his friends. None of us were ready for this day. We mourn his loss from our own lives and what he was to each of us. That is so personal, so intimate, so down inside. It would have been so much easier to celebrate his life with him here but he's gone, irrevocably gone. So now we have loosed our grip upon him but we shall always retain his memory and are part hearts. God has come now to take them back. We all knew on one unknown day he would return to his God. Now we give him up, we commend him to your loving hands. Thank you for him. God rest his soul.